Our smartphones and phablets are more than simply communication devices; they’re lifestyle support systems. Oh, you may laugh, but with all of the available apps and software patches our smartphones are being put to an amazing number of diverse uses. We check the weather with our weather apps, we plan our trips with GPS and mapping apps, and we manage our budgets with money saving apps. Then of course, there are games and the internet, eBooks and music…. the list of smartphone wonders seemingly goes on forever. One of the most popular app genres is health and fitness, and millions of smartphone owners use their devices to govern their diets and manage their workout routines. So, with our New Year’s resolutions still fresh on our lips, it seems a good time to look at some of the most popular health and fitness apps currently available for smartphone users. Food Planner Mobile App for Recipe management, Inventory, Groceries, Meal Planning and so much more! Food Planner is the one-stop shop for people trying to eat healthy and/or lose weight. This free app allows you to upload your own recipes, as well as directly download recipes from the internet. AS an added plus, it also calculates the nutritional values for the recipes you save. The app automatically generates shopping lists for the ingredients needed for your weekly meals, and keeps a running tally on the kitchen staples you use every day. Food Planner is supported on a number of platforms, including iOS and Android, and can be synced to the Cloud so your recipes and nutritional data can be shared and accessed from any device. Mint Nutrition: Track your nutritional facts while out to eat with ease. For people who like to eat out, but still want to watch their diet and eat well, there is Mint Nutrition. This easy to use app helps you to choose the healthiest options whenever you are out at your favourite restaurant. Mint Nutrition contains nutritional data from a wide array of popular restaurants (including those fast food giants that we all pretend to hate and avoid), and you can manually added menu data from personal favourites. Mint Nutrition is available for iPhones and iPads, and only costs £1.49. Weight Watchers Simple Start app is dedicated to inspiring and helping you adopt a healthier way to live. Weight Watchers Simple Start isn’t just about losing weight, it’s designed to help people eliminate poor nutritional habits so they can learn to live well and eat healthy. With more than 55 meals and snacks to choose from, this Weight Watchers app makes it easy to plan a week’s worth of tasty, and nutritionally sound, meals. The app does more than count calories though, and users will receive rewards and special motivational messages to help them stay on track. Weight Watchers Simple Start is available for iPhone and Android. Top 4 Health and Fitness App: Can I Eat It? Can I Eat It: Food and drink app for savvy shoppers. This clever little app makes shopping for healthy foods a breeze. Simply scan the barcode on the food packaging, and the app gives you a nutritional breakdown of the product. The app will show you a green thumbs-up for healthy choices, an amber thumb for questionable choices, and a red thumbs down for poor choices. With Can I Eat It you’ll never again be at the mercy of confusing product labels. This app is currently only available for iPhones, and will set you back about £2.29. Moves helps you to monitor your everyday exercise routines. Moves automatically tracks any walking, running, or cycling that you do, monitoring duration and calories burned for each activity. You can easily add up to 60 different exercises, including most gym routines. Monitoring your regular activities helps you to set, and keep, exercise goals. Moves is available for iPhones only. Strava is a free fitness app that allows you to track and record your daily running and cycling routines. Strava calculates speed, distance, and altitude. The data can then be uploaded to the main Strava website so you can track your progress, and plan your future exercise routines. Strava users can take part in online and real world challenges, keeping personal motivation at a peak. Strava is available for iPhone and Android devices. For those who want to keep fit, while balancing mind and body, Yoga Studio is the go to app. Yoga Studio delivers over 16 hours of video classes, and teaches users more than 260 yoga moves. The app accommodates all levels of users, from beginners to advanced. This comprehensive yoga app also allows users to create their own yoga routines. Yoga Studio is available for iPhone and Android, and costs around £1.49. 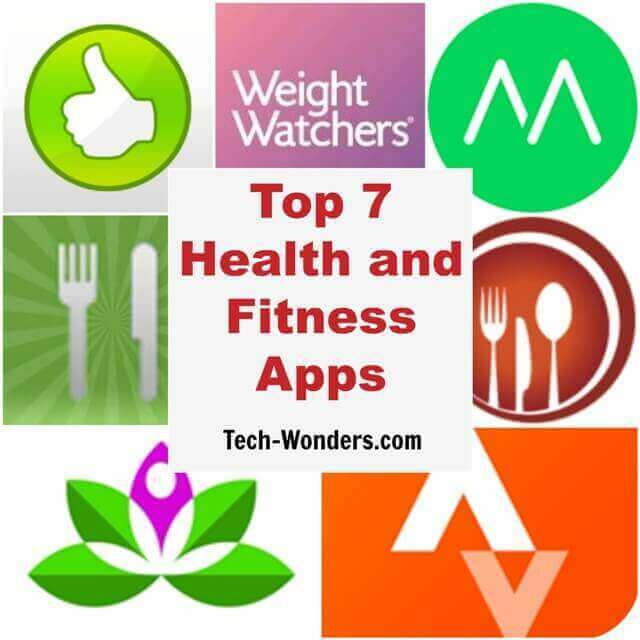 So there you have it, seven top health and fitness apps to help you eat healthy and get in shape this year. Remember, that fancy phablet you got for Christmas can do more than make calls and send texts. It can also help you get into shape and feel better. So, when you’re downloading that new game app, why not add a health or fitness app to your shopping cart? You’ll be glad you did.